It’s actually winter here in Southwest Florida, and just like you, the many critters that live here are feeling the cold and seeking ways to get warm. One of the ways to get warm is to come into your home. Now what does this have to do with your air conditioning system? There must be some exchange of indoor and outdoor air for an HVAC system to work well, and this unfortunately can provide an opening for critters to get in. While a well-maintained system has numerous safeguards to prevent pests from getting inside, many unwanted house guests only need a tiny amount of space to sneak in. Maintaining your HVAC system and controlling pests may seem like two completely separate concerns, but they overlap in many ways. The saliva, skin cells and droppings left behind by pests can be serious irritants for sufferers of asthma and other respiratory conditions, and this creates an indoor air quality issue. Rodents can chew up or build nests in your sensitive system components, which causes all its own issues. Fortunately, what’s good for pest prevention is usually also good for your HVAC system. Control dampness—Let’s face it, Southwest Florida is a wet place to live. Virtually all pests rely on water to survive, so water is a primary way pests get attracted to your home. Avoid puddling water in and around the home, especially near your outdoor air conditioning condenser. Use dehumidifiers in areas where moisture is a problem. Make sure your ductwork has a tight seal— Cracks, Gaps, and larger disconnections in your duct system create points of entry for critters to get into your HVAC system, as well as your home. Insects, mice, and larger vermin, like rats, squirrels or raccoons may enter through your duct system, depending on the size of air leaks. If you do have pests in the system, it’s important to know that trapping is a better option than pesticides, when it comes to ductwork infestation. 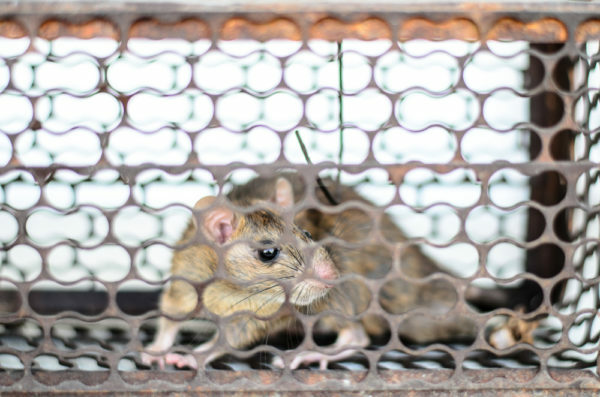 Live traps can be set around the ducts to trap larger pests such as mice and rats, so they can be removed, while glue traps can be used to catch insects. Install vent covers—One of the ways to prevent pests from using your HVAC system to gain access to your home, is by fitting vents with protective screens. Your home or business may also have fresh air intakes and other exterior vents which are components of ventilation systems, such as whole-home ventilation or exhaust fans for kitchens and bathrooms. Critters can enter the house through exterior vents, and often find these areas to be an ideal location to build their nest. You need to install vent covers on all exterior flues, intakes, and exhaust vents. These covers will block pests’ point of entry, preventing them from travelling inside your home or business, and keeping your pipes clear of nests. These covers have additional benefits, such as keeping rain water out of your vents. Make sure vent covers are installed tightly; small animals can be resourceful, and may find a way to pull off your covers if they are not on securely. Maintain your air conditioning condenser—Rodents and other small animals can cause extreme damage to your exterior air conditioning condenser. They can damage components by chewing, scratching, urinating, and more— even their presence can harm the system, should you happen to turn the air conditioning system on when they are inside. Your best line of defense in protecting your condenser is preventing rodents from coming near it to begin with. Keep the area surrounding your condenser clear of vegetation like weeds and debris by cleaning around it on a regular basis. Cut away vegetation and clean excrement, which can attract vermin to the area initially. Warm water and a mild soap can be used to scrub the exterior of the unit as well as the surrounding area. Use a pet repellant to deter animals from coming to the area. Pet repellants contain scents, which are unattractive to animals, so by spraying it around the condenser and its surroundings, animals will not want to come nearby. Pet repellants are a safer alternative to chemical pest treatments as they are natural, so you won’t risk the negative side effects of pesticide exposure when working to prevent pest issues. Get a maintenance plan— Make sure you’re having regular maintenance done on your HVAC system—this will help keep the system clean and help prevent any new infestations. Our semi-annual HVAC Maintenance package will save money on possible larger problems that can crop up and give you peace of mind. Not only are we able to keep your HVAC unit in good repair, which lowers your electricity bills, but a professional inspection and tune-up is the best way to check for signs of any critter infestation in your system and your home. For this and all of your HVAC needs, contact Wayne Martin and Son Air Conditioning at 239-462-4068.